The first part of the presentation really focused on some trends that I have noticed where in the past Moodle has sometimes been an isolated installation within an institution, perhaps a department or a faculty deploying it for a project, or a specific set of courses, this has started to change. 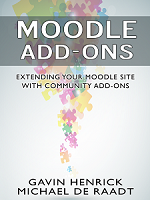 Usage of Moodle 1.9 sometimes had â€œallâ€ the plugins and features being built within it. Only some used external repositories and Moodle wasnâ€™t always fully integrated into the institution systems however now, a new picture is emerging where usage of Moodle is seen in a wider context. This new picture places Moodle as part of the overall learning eco-system where it handles the course management and where other systems that are integrated into Moodle handle the other various services that are needed such as ePortfolios, file management and Multimedia. This also has changed the challenges encountered by the Moodle administrator who must have a mastery and understanding of all these aspects now, not just Moodle but the whole learning eco-system. the recognition that as we move forward over the coming years one system cannot do it all. Moodle 2 has enabled much tighter integration with repositories, eportfolio systems and other platforms especially with the new web-services options. customer needs are diversifying due to the nature of the new users of Moodle. The more government bodies, corporates and organisations that use Moodle the more a new approach is required. However one of the key reasons for all of this is acceptance across more and more sectors that Moodle is a viable choice for all as an elearning tool. This can be demonstrated by the increasing multi-sector take up of Moodle globally. the lessons learned and some advice to others considering starting an implementation.